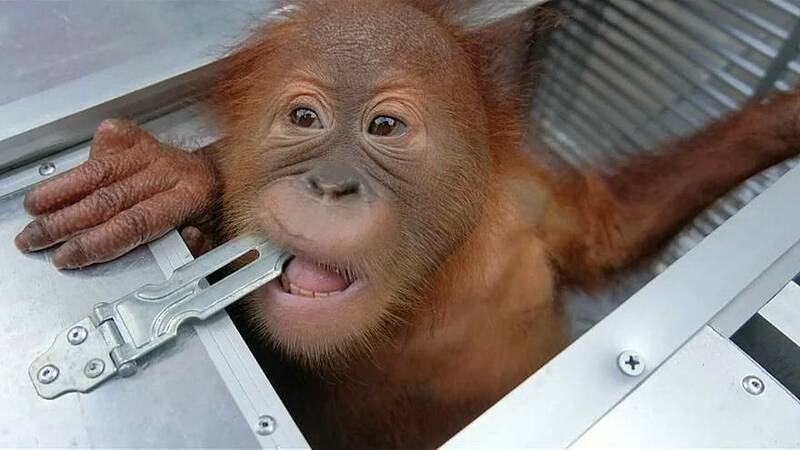 A baby orangutan has been rescued from the suitcase of a would-be smuggler. The two-year-old male was found during an X-ray security screening at an Indonesian airport and appeared to have been drugged, according to officials. The primate made an appearance at a press conference with his rescuers and seemed to have recovered from his ordeal. Indonesian police also brought Russian national Zhestkov Andrei, who was caught trying to smuggle the orangutan, to the news conference on Monday. Andrei could face up to five years in prison and a 100 million Indonesian rupiah (€6,185) fine for violating the law in relation to endangered animals. Geckos and lizards were also found in the suspect's possessions, said Bali police chief, Ruddi Setiawan. He added: "With the help of airport security, we [found] the baby orangutan who was inside the suitcase and [had] been drugged, [and] was about to be smuggled to Russia. "The suspect was found with a baby orangutan, two live geckos and four live lizards inside a box." Orangutans are native to Indonesia and Malaysia, found in the wild on the islands of Sumatra and Borneo. Some species are endangered and all are protected. Illegal wildlife trade is rampant in Indonesia, despite efforts by authorities to crack down on smugglers.